This is the 101st Boys’ Sweet 16, which means there have been close to 1,500 state tournament games played over the last century. 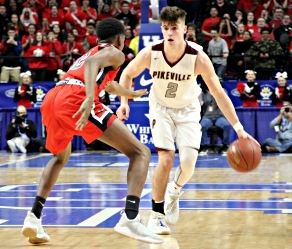 I’d argue that none have been any better than Pikeville’s first-round, triple-overtime, heart-stopping 72-69 victory over John Hardin in Rupp Arena Wednesday night. Pity those fans among the 10,233 in attendance who trickled out of Rupp Arena before it was over. “That’s one of the best games I’ve ever been a part of,” said Panthers Coach Elisha Justice, who was the star of Shelby Valley’s run to the state title in 2010. The underdog Panthers — some people rated them last in the 16-team field — showed incredible resiliency by coming up with clutch play after clutch play to stay alive. First, there was Wyatt Battaile nailing a buzzer-beating three-pointer from the right wing to tie it 52-52 and force the first extra period. Next, there was Evan Rhodes getting fouled on a three-point try, then stepping to the line and making three free throws with :03.6 left to send the game into second OT. Then it was Christian Billitter’s turn, hitting a three from the top of the key to tie it 61-61 with :16 remaining and taking it to yet another extra period. Pikeville edged out to a 5-point lead in the third overtime, then held on for dear life. John Hardin, which showed a ton of resolve after its star player Mickey Pearson fouled out late in the second OT, had the ball with a chance to tie in the closing seconds, but couldn’t find the basket. The game-tying three-point shots by Battaile and Billiter were remarkable, but they made them in the flow of the game, with adrenaline fueling their heroics. Rhodes may have had the toughest task, having to wrangle his nerves under control, with victory or defeat at stake, and sink three foul shots. After he hit the first two, John Hardin called a timeout to try and ice him before his third attempt. Battaile, who quarterbacked Pikeville’s football team to a state title in 2015, showed he’s got plenty of hoops skills. The 6-foot-4 senior had 30 points and 7 rebounds to lead the Panthers. Conner Roberts had 14 points and corralled 6 rebounds, most of those coming at crunch time. Rhodes finished with 11 points. John Hardin was led by Malik Wright’s 19 points and 10 rebounds. Pearson, who has signed with St. Louis, had 18 points and 8 boards. One of the more remarkable aspects of the triple-overtime thriller was that Justice barely showed any emotion on the bench. His demeanor resembled a guy picking up his dry cleaning. But didn’t he have a few knots in his stomach during the game’s tense moments? “Oh gosh, it was a different story going on inside from what I was showing on the outside,” he said with a laugh. “What we did winning a championship (at Shelby Valley) was an amazing accomplishment. The victory also served as a piece of good news to the Pikeville community, which was shocked when Scotty Hamilton, a 12-year veteran of the Pikeville police department, was shot and killed Tuesday night. The Panthers’ players wore blue ribbons on their sneakers, and Justice had a blue ribbon on his sports coat.